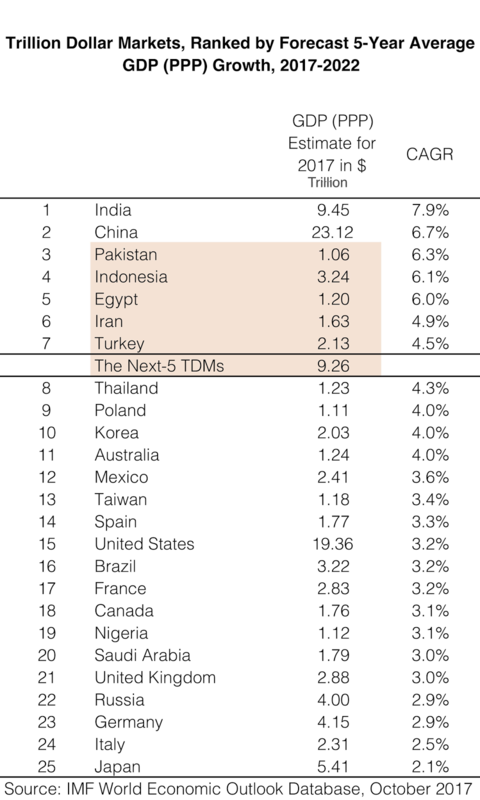 Pakistan has a population of over 200 million people and a booming trillion dollar economy ranked among the top 25 largest economies of the world. Pakistan's 135 million millennials have made it the world's fastest growing retail market. There is surging demand for fast moving consumer goods (FMCG) and durables like smartphones, computers, cars, motorcycles and home appliances. Major energy and infrastructure projects, part of China-Pakistan Economic Corridor (CPEC), are transforming the country and creating millions of new jobs. Incidents of terrorism and terror related deaths are in sharp decline since the country's military started nation-wide anti-terror operations in 2013. Its $20 billion tourism industry is seeing rapid growth. And yet, many continue to call Pakistan a "failed state". Why is it? Why is perception lagging reality? Thank you. It is so important to talk about positives among all the negatives that social media is flooded with. You are one person who is always balanced. I feel it's becoming more and more uncommon to see a balanced analysis coming from Pakistanis. There are many who speak out only when they have to criticize and I never see them talk about positive side of Pakistan. In the midst of such Facebook junkies and self proclaimed activists, you're a shining star! Keep doing your bit. Jahan ghalat ko ghalat kehna zaroori hai waheen sahi ko sahi kehna bhi utna hi zaroori hai. Great Job Faraz, Riaz Haq and Monis. Hope to see more shows on the Positives of Pakistan. KARACHI: Pakistan’s consumer confidence has reached an all-time high of 111, up by nine points in the third quarter (July-September) of 2017, from 102 points in the previous quarter (April-June), according to the Nielsen Global Survey of consumer confidence and spending intentions. “The nine-point increase in Pakistan’s consumer confidence score depicts an improving outlook for the country,” Nielsen Pakistan Managing Director Quratulain Ibrahim was quoted as saying in the press release. “Since Nielsen launched the survey, this has been the highest number reached to date, which can be attributed to several reasons such as the growth in the agricultural sector, controlled inflation, strengthened power supply and most importantly, the uplift in the job market. Pakistan is flourishing and is rated as one of the top growth markets in the Middle East & Africa region.” The survey data highlights a positive perception of job outlook, increasing from 47% in the second quarter to 57% in the third. 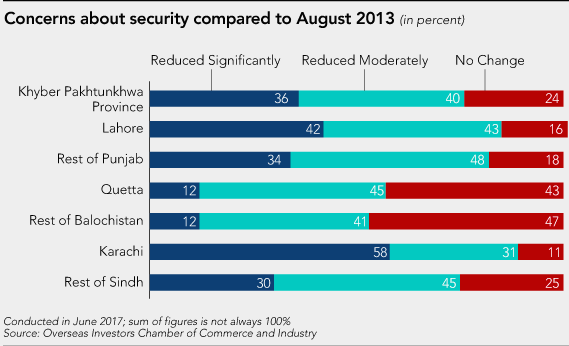 Although there has been a one percentage point dip in job security being the biggest concern over the next six months, it still remains the top concern amongst 21% of Pakistani consumers. Consumers are spending more on vacations and technology in third quarter, suggesting that they have more disposable cash. Regionally, there has been a one-point increase in the index level. Africa / Middle East has also witnessed a one percentage point increase in the job prospects (38%), with no change in the state of respondent’s personal finances. Spending intentions increased one percentage point to 34%. Four out of six Africa / Middle East markets showed consumer confidence gains. Pakistan’s consumer confidence rose the most, by nine points (which stands at 111). United Arab Emirates (112), South Africa (83) and Egypt (81) were amongst the other countries showing an increase in consumer confidence index. Conversely, consumer confidence fell in Morocco (72) and Saudi Arabia (93), declining by five points in both countries. There is no clean water to drink. Pakistan is rising. Rising to what. Another billion $ politician on Forbs List. Mr. Haq. You think we are that stupid. How long you will jerk us around? It is time to take out your head from the sand. Go ask the parents of Zainab, if Pakistan is rising? Taj: "Pure academic. Pure academic....."
Riaz Sahib, what do you make of all the reports that say that the price of energy is too high compared to other countries in the energy contracts Pakistan has signed with CPEC? RA: " what do you make of all the reports that say that the price of energy is too high compared to other countries in the energy contracts Pakistan has signed with CPEC?" First, I believe it's part of a campaign of fear, uncertainty and doubt (FUD) being waged against CPEC by enemies of China and Pakistan. Second, all the contracts awarded under CPEC follow Pakistan's longstanding IPP policy developed in 1990s that precedes CPEC. The IPP policy was designed to attract private investments in Pakistan's energy sector to meet exploding demand. The entire energy portfolio will be executed in the IPP mode —as applied to all private power producers in the country. Foreign investors’ financing comes under foreign direct investment; they are guaranteed a 17pc rate of return in dollar terms on their equity (only the equity portion, and not the entire project cost). The loans would be taken by Chinese companies, mainly from the China Development Bank and China Exim Bank, against their own balance sheets. They would service the debt from their own earnings without any obligation on the part of the Pakistani government. Import of equipment and services from China for the projects would be shown under the current account, while the corresponding financing item would be FDI brought in by the Chinese under the capital and finance account. Therefore, where the balance of payments is concerned, there will not be any future liabilities for Pakistan. To the extent that local material and services are used, a portion of free foreign exchange from the FDI inflows would become available. (Project sponsors would get the equivalent in rupees). For example, a highly conservative estimate is that only one-fourth of the total project cost would be spent locally and the country would benefit from an inflow of $9bn over an eight-year period, augmenting the aggregate FDI by more than $1bn annually. This amount can be used to either finance the current account deficit or reduce external borrowing requirements. Inflows for infrastructure projects for local spending would be another $4bn over 15 years. India needs a sound economic and political strategy to maximize the benefits it receives from Chabahar. The first shipment to pass through the port of Chabahar to Afghanistan was celebrated with much fanfare and excitement this late October. India, with the largest economy in South Asia and an ever-rising military footprint has much to be proud of regarding this development. In the face of regional tensions with its western neighbor, Pakistan, India has chosen to circumvent the nation in order to open new trade routes with Afghanistan and greater Central Asia. Delhi may now find it easier to further diversify its trading partners, strengthen its relations with regional neighbors, and simultaneously compete with China’s Belt and Road Initiative. While the potential for Chabahar’s positive externalities remain numerous, they also remain largely hypothetical. The completion of the project does not necessarily guarantee an increase in Indian economic influence, considering the economic and political realities that Delhi presently faces on the domestic front and in the region. The competitiveness of Indian exports, the security situation in Afghanistan, and regional geopolitics pose several hurdles that India must overcome. Domestically, India faces a slowing economy that has had six continuous quarters of decreasing growth. The economy rebounded in the latest quarter but growth forecasts for the economy continue to be revised downwards due to recent poorly executed economic reforms (the Goods and Services Tax and demonetization). This becomes further troubling as the Indian economy continues to be faced with a critical job shortage that must incorporate 12 million young people every year. Additionally, India’s banking sector continues to pose risks to the economy with non-performing assets (bad loans) continuing to rise to unprecedented levels. In light of domestic economic challenges, Delhi would be wise to draft a comprehensive economic strategy to justify the cost of the overall investment in Chabahar and the overall multinational initiative. Currently, India has allocated around $2 billion to the overall project — $500 million dollars has been allocated to the construction of Chabahar port to increase cargo handling capacity and $1.6 billion to the construction of a rail link that will connect the port to the city of Zahedan. The city borders Afghanistan and will allow goods to flow into the country through already built infrastructure. Chabahar port will also serve as a starting point for the over-arching International North-South Trade Corridor (INTSC) that aims to connect India, Iran, Russia, and various Central Asian states. Remarks by Indian Prime Minister Narendra Modi and various analysts claim that the new port will revolutionize trade and commerce. This may prove to be true if India is able to drastically improve the efficiency of its manufacturing sector and increase the demand for Indian goods. Yet, the current status quo will prove difficult to change considering both the cost and share of total exports India sends to Central Asia (including Afghanistan) when compared to other nations, specifically China. In early July, the Minister of State for Micro, Small, and Medium Enterprises, Haribhai Chaudhary, was asked why domestically produced goods cost more than those imported from China. Chaudhary responded, “The products manufactured in China are reportedly of lower price mainly because of their opaque subsidy regime and distorted factor prices.” India’s economy is primarily based on the services industry, which composes more than half of its GDP, compared to industry (including manufacturing), which only composes a little more than a quarter. China’s economy on the other hand, is primarily composed of industry, giving it greater leverage and ability to compete with Indian goods. ISLAMABAD, Jan. 25 (Xinhua) -- Pakistani National Electric Power Regulatory Authority (NEPRA) announced on Thursday to reduce the electricity price by 2.99 rupees (2.7 U.S. cents) per unit under the fuel adjustment for the month of December, 2017. The decision in this regard was taken in a public hearing, which was conducted under Chairman NEPRA Tariq Saddozai in Islamabad. The hearing was conducted upon request of the Central Power Purchasing Agency (CPPA) which requested the NEPRA to cut the power price. The CPPA informed at the hearing that the generation of electricity during December was recorded at 7.76 billion units, which was produced at 5.11 rupees (4.6 U.S. cents) per unit while its cumulative cost was 40.60 billion rupees (0.37 billion U.S. dollars). The power distribution companies charged consumers 8.10 rupees (7.3 U.S. cents) per unit during the month under review, it added. For two-time Grammy winner Diplo, playing Pakistan is a way to foster good relations with the mostly Muslim country after an angry Jan. 1 tweet from U.S. President Donald Trump complaining that Pakistan gives "terrorists" a safe haven. "I think the best way we can do any kind of diplomacy with the Pakistani people is ... basically reaching out to the kids like we do at the concerts," Diplo told TMZ last month after the Trump tweet, which soured U.S.-Pakistani relations. He added that by having U.S. acts connect with the large youth population - an estimated 60 percent of Pakistanis are under age 30 - "they can grow into being our allies". More than 2,500 young people crowded into an outdoor venue in the capital, Islamabad, to a scaled down version of the event known for bringing together some of the hottest names in dance-hall, hip hop and electronic music. Among the headliners were Diplo's chart-topping side project Major Lazer Soundsystem, DJ Chrome Sparks and Pakistani duo SNKM, which has played the South by Southwest festival and toured with Diplo in the U.S.
Front pages are grim for the same reason that Shakespeare’s plays feature a lot of murders. Tragedy is dramatic. Hardly anyone would read a story headlined “100,000 AEROPLANES DIDN’T CRASH YESTERDAY”. Bad things often happen suddenly and telegenically. A factory closes; an apartment block burns down. Good things tend to happen incrementally, and across a wide area, making them much harder to film. News outlets could have honestly reported that the “NUMBER OF PEOPLE IN EXTREME POVERTY FELL BY 137,000 SINCE YESTERDAY” every day for 25 years. But readers might get bored. Belief in equality for ethnic minorities and gay people has shot up, as demonstrated not only by polls (which could be biased by the knowledge that bigotry is frowned upon) but also by internet activity. Searches for racist jokes have fallen by seven-eighths in America since 2004. Those who enjoy them are dying out: online searches for racial epithets correlate with interest in “Social Security” and “Frank Sinatra”, Mr Pinker notes. Even the most conservative places are loosening up. Polls find that young Muslims in the Middle East are about as liberal as young western Europeans were in the early 1960s. This week I asked a group of students at the University of Chicago a question I’m asking students around the country: Who are your heroes? There’s always a long pause after I ask. But eventually one of the students suggested Steven Pinker. Another chimed in Jonathan Haidt. There was general nodding around the table. That was interesting. Both men are psychology professors, at Harvard and N.Y.U., who bravely stand against what can be the smothering orthodoxy that inhibits thought on campus, but not from the familiar conservative position. One way Pinker does it is by refusing to be pessimistic. There is a mood across America, but especially on campus, that in order to show how aware of social injustice you are, you have to go around in a perpetual state of indignation, negativity and righteous rage. Pinker refuses to do this. In his new book, “Enlightenment Now,” he argues that this pose is dishonest toward the facts. There’s a fair bit of social mobility. Half of all Americans wind up in the top 10 percent of earners at at least one point in their career. One in nine spend some time in the top 1 percent. Poverty has been transformed by falling prices and government support. “When poverty is defined in terms of what people consume rather than what they earn, we find that the American poverty rate has declined by 90 percent since 1960,” Pinker writes. America has a pretty big safety net. Our numbers look bad because so much of our health care spending is funneled through employers, but when you add this private social spending to state social spending, America has the second-highest level of such spending of the 35 nations in the Organization for Economic Cooperation and Development, after France. Pinker has data like this in sphere after sphere, marking the progress we’ve made in health, the environment, safety, knowledge and overall happiness. So is he right, that society is in much better shape than we’re allowing? The ‘Eighteen Islamabad’ development will feature more than 1,000 homes, a golf course and a mall on 2.25 million square meters of land. It will take six years to complete, said Tarek Hamdy, chief executive officer of the development. Sawiris holds 60 percent in a joint venture with local firms Kohistan Builders and Developers and Saif Group, owned by Pakistan’s prominent Saifullah family.